In order to both navigate and type the detailed log of the expedition, Ron often found it necessary to bring his typewriter up on the deck where he could watch wind and course while writing. The descriptions rapidly typed on that hatch cover were sent to the Navys Hydrographic Office in Washington, D.C., for use in revising the official charts and piloting books published for mariners by the government--and also to prepare defensive strategies against a possible invasion by Japan. Ron also took numerous photographs, sometimes the very first taken of these areas and landmarks, to supplement his written descriptions. The Hydrographic Office used them to prepare sketches to be printed in the pilot books alongside the data from his notes. But often Rons photos went a step further, employing the use of a stereo-optic camera. When observed through a special viewer, the double-image photos provided a realistic three-dimensional rendering-remarkably similar to the actual scene. This would help the Hydrographic Office assess the size of coves and inlets regarding their capability in hiding enemy vessels. Although Rons work would help clear the way for other mariners who followed in his wake, for now, uncharted hazards were to be found everywhere. 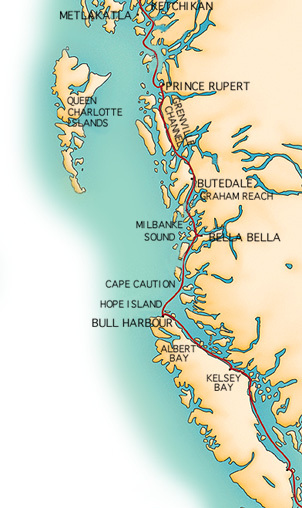 The forceful tides driven through the narrow channels approaching Cadboro Bay, for example, drove him into waters strewn with reefs. Extricating Maggie unharmed, Ron sought anchorage in Victoria, where he took a lay day to complete a rigging project at the top of the mast. 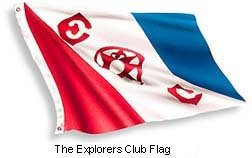 Now out of U.S. waters and with the Alaskan Radio Experimental Expedition officially underway, it was fitting he raise the Explorers Club flag--the flag bestowed upon Rons expedition three months earlier. So, in pouring rain, he hauled himself up the mast--some 35 feet above the deck--and attached a jackstaff from which to fly the colors of the Explorers Club. With the red, white and blue standard now fluttering above, Ron joined the ranks of those exceptional few who had led expeditions under the Explorers Club banner: Admiral Byrd and Sir Ernest Schackleton carried the Clubs flag into the polar wastes and it was taken deep into the Gobi Desert by Roy Chapman Andrews. As of 1940 it had only flown above 108 expeditions, including the Magicians journey.